Are you a teacher who looks to give your students a meaningful experience beyond just curriculum in what they learn? Are you an educator who wants to utilize stories that teach lessons and positive values for your students’ lives today and for the future? Progressive teachers have been the ones who have answered yes to these questions. 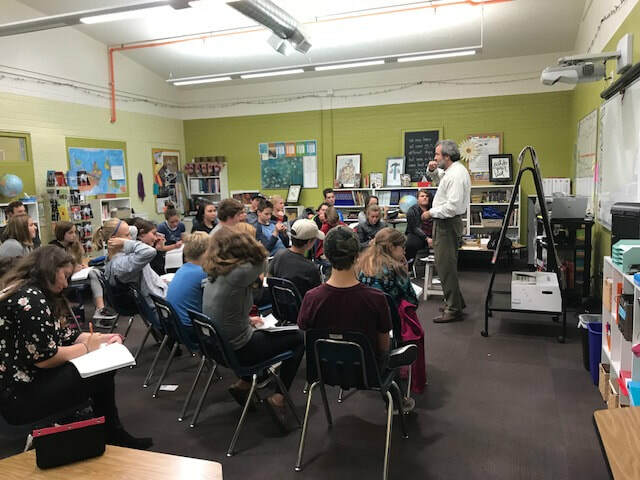 They have had their students read Two Among the Righteous Few: A Story of Courage in the Holocaust and had Marty come to their classes to lead discussion on the book. 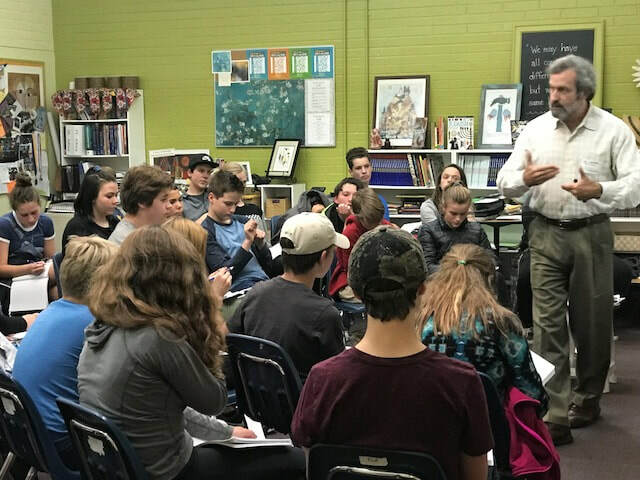 When the students have a chance to interact with the actual author and share their insights and questions about this special story, high educational impact occurs. 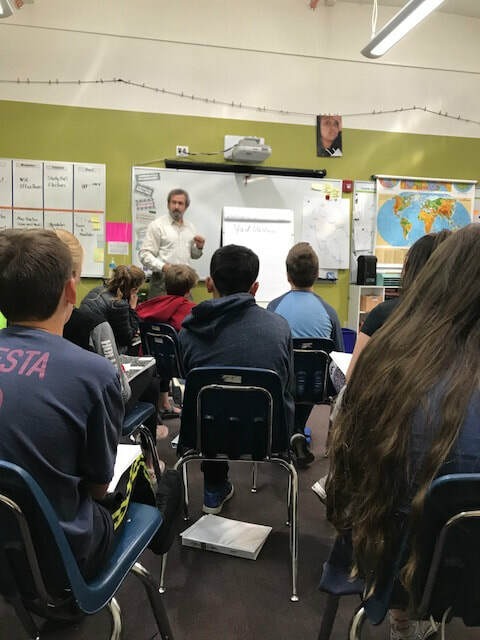 These book discussions have occurred with middle school, high school, and college classes in the San Francisco Bay Area and the Phoenix area. Teachers in Social Studies, English or Language Arts, Religious Studies and Social Justice as well as any Humanities subject are the ones who have been building this experience and tradition of discussion with Marty and his special story. Skype can be used for other locations. The title of the book is not Two Among the Righteous Many, as only a few people throughout Europe did the kind of rescue work in the Holocaust as Frans and Wijnakker. Why did so few people help? If one earns the honor as Righteous Among the Nations, as mentioned in the Introduction of the book about the Wijnakkers, what does this truly mean about such a person(s)? What were a few of the highlights or key aspects of this true story that stood out to you? How would you describe the character of Frans Wijnakker and why? How would you describe the character of Mien Wijnakker and why? If you had a chance to talk live with author Marty Brounstein, what questions would you want to ask him? What is Marty’s meaningful personal connection to this story and its heroes? If you had a chance to talk to Marty’s wife, Leah Baars, what questions would you want to ask her? Taking away the life and death aspects of this story, what positive lessons does it teach for your life today and for the future? Feel free to contact Marty to discuss these questions further as well as to explore involving him in a book discussion with your class through the link below. 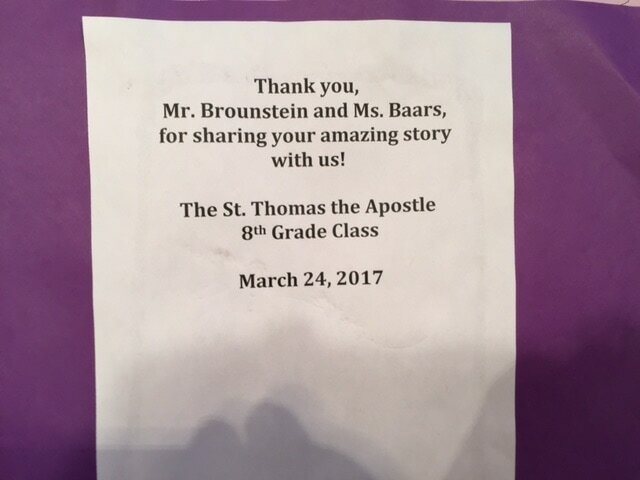 Here are two pictures from a 6th year book discussion on the special story with the 8th grade class with St. Mary's in Walnut Creek, CA. Not only were the students involved but parents and grandparents were on hand to participate in the discussion with Marty and Leah. Thanks to a master teacher, Jodie Russi, we had another highly engaged and impactful session. Jodie was the 1st teacher who brought Marty in to discuss the story with her students who had read the book as part of their Language Arts and History studies and has been a great supporter throughout his journey with the story. 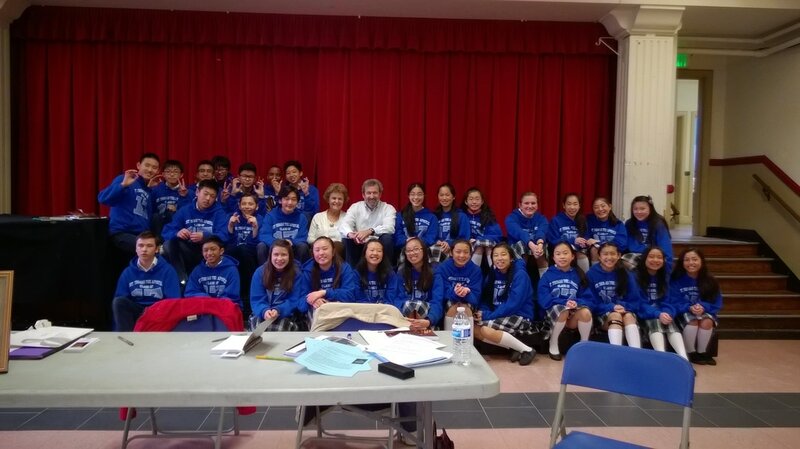 During the course of the journey, many rich and engaging book discussion sessions have occurred in middle school, high school, and college classes with Marty facilitating discussion with the students who have already read the book prior to his coming to the class. What makes these sessions have such high educational impact is not only the students themselves but also the quality teachers who have guided their students through the reading and prepared them well for the class discussion session. 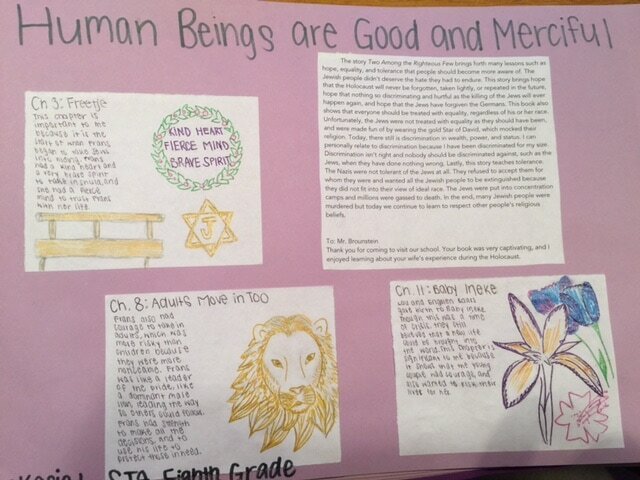 A great example of this occurred at St. Thomas the Apostle Catholic School on March 24, 2017 with the 8th grade class of a fine teacher, Alicia Cabe-Reyes. 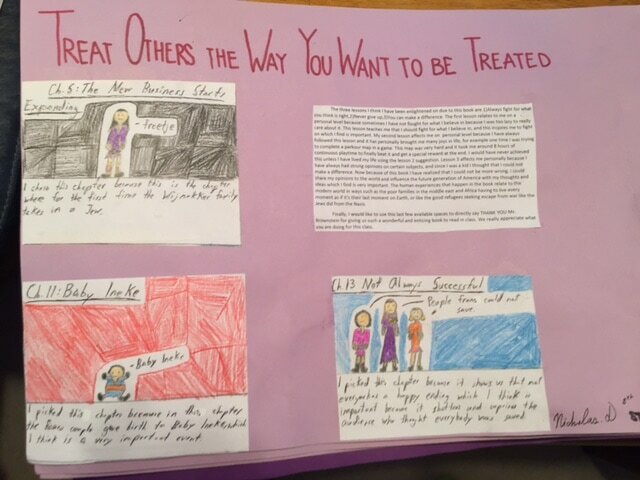 In the rich discussion over a nearly 90-minute session, the students highly engaged and shared highlights they got from the story and offered lessons the story teaches them for their lives today and in the future. They also asked thoughtful questions to Marty and his wife Leah Baars (Chapter 11) who was on hand. savages as they were often portrayed. found ways to do what they knew was right. something more with your life, to choose to be of service to others and to the world. book was in chapter 2 when Frans agrees to house a young Jewish girl for three weeks. principle, even though most other Dutch did not. unimaginable threat of genocide could have been saved -- history may been rewritten. wrote their own history. I am humbled to have been able to got to know their story.